Peter Dillon – UI-UX Designer located in NYC. I specialize in creating engaging solutions to solve real world problems while designing beautiful applications that make the lives of users easier. I have designed solutions for a wide range of UI scenarios and businesses. Whatever the challenge may be, I have the experience and ingenuity to solve them. I am pleased to announce I have been hired by Canon to work at the American headquarters located in Melville NY. I will be on a few different teams building internal administration applications as well as contributing to their highly visible external e-commerce solution. The team consists of a group of highly skilled, experienced and engaging individuals that I am grateful and excited to be a part of. I have recently completed an extended project to create and implement the desktop and responsive versions of this awesome e-commerce website. Based on a set of starting point PSD’s provided by third party design teams, I completed the desktop designs, as well as fully design the responsive mobile versions of the entire site. I lead the functional demonstrations with top level stakeholders, ensuring the project proceeds quickly and all parties are satisfied with the progress. Update: Site has been released – view now! For the prototyping phase of this project I used Sketch, the Adobe Suite, Invision-App, HTML and CSS/SASS. During this time, the dev team transformed and is now lead by the incredibly talented Daniel Chavez. Daniel has upgraded the development process to be streamlined, modernized and really fun place to work! The system is built with a mixture of Laravel and React. We use Git with BitBucket for version control and JIRA for issue tracking. Completed project built with Angular 2 and Ionic 2. I used Balsamiq for the low fidelity prototype, and Sketch with Invision for high fidelity design. For most of 2016 I was employed by Adecco Group NA where we developed six of Adecco’s international job posting websites. I also created a Virtual Assistant prototype with Ionic and Angular. 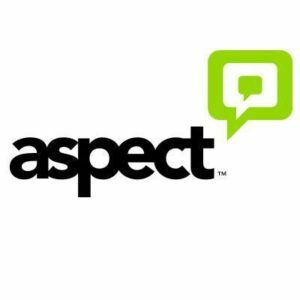 Also while employed at Aspect, I gave a presentation to the entire department (over 60 people) discussing modern UI and UX design in lay terms. 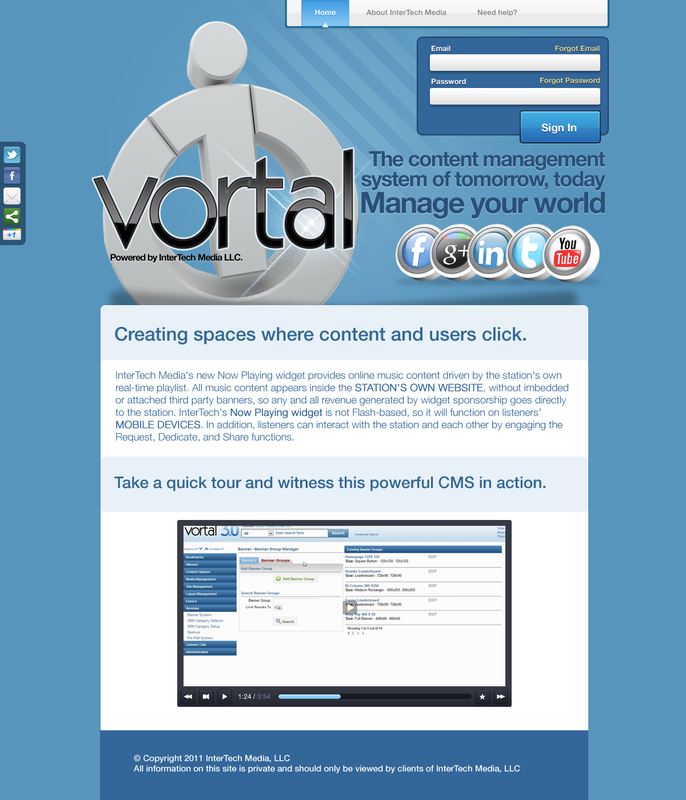 Complete redesign and improvement of the flagship CMS product named Vortal. Created styles guides pattern library with copy/paste code snippets so developers could get projects finished quickly an effortlessly adhere to the company design aesthetic. Single handedly designed and developed the interface for ITM’s latest product Zocle – a social management dashboard tool. Sometimes I’ll do a customized a simple WordPress site for a friend. 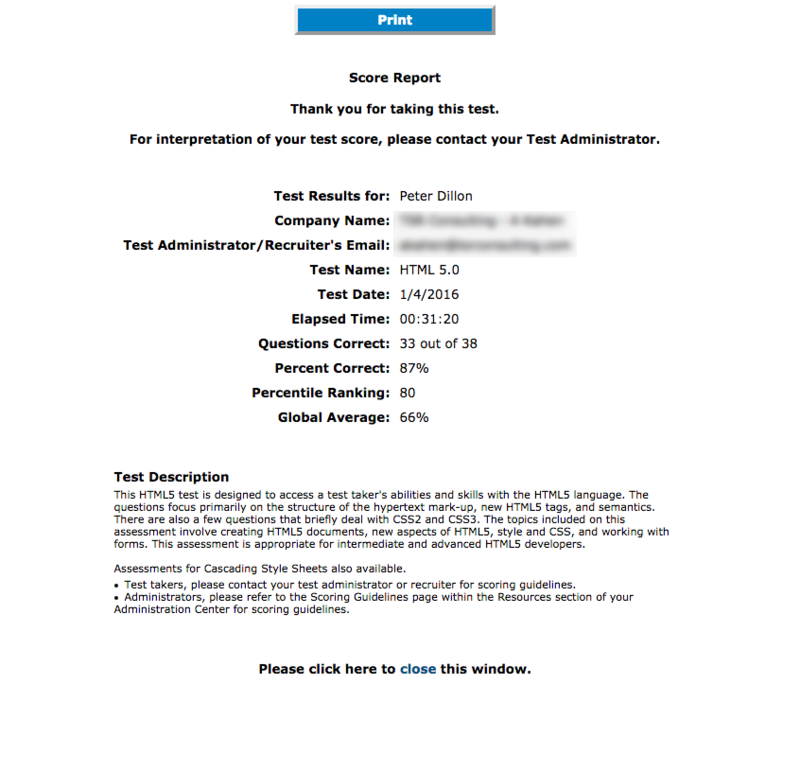 I was recently tested on HTML5 and passed with a high score. View details.